WeBS Low Tide Counts are made using so-called ‘look-see’ methodology (Bibby et al. 2000), whereby the observer, familiar with the species involved, surveys the whole of a predefined area. Counts are made estuaries, following designated SPA site boundaries. Numbers of all waterbird species, as defined by Wetlands International (Rose & Scott 1997), are recorded. In the UK, this includes divers, grebes, cormorants, herons, Spoonbill, swans, geese, ducks, rails, cranes, waders and Kingfisher. Counts of gulls and terns are optional. In line with the recommendations of Vinicombe et al. (1993), records of all species recorded by WeBS, including escapes, are collected to contribute to the proper assessment of naturalised populations and escaped birds. The scheme provides information on the numbers of waterbirds feeding on subdivisions of the intertidal habitat within estuaries. Given the extra work that Low Tide Counts entail, often to the same counters that carry out the Core Counts, WeBS aims to cover most individual estuaries about once every six years, although on some sites more frequent counts are made. for Low Tide Counts are much the same as for Core Counts, although unlike for the standard monthly WeBS Core Counts, the Low Tide scheme doesn't demand that you count on specific dates, so it is really up to you what spatial and temporal extent you cover. The ideal is one count of each sector in each month November - February during the two hours either side of low tide, preferably spaced evenly apart, with co-ordination between counters on different sectors. The reality is often very different! For instance, it does not necessarily matter if one month's worth of counts is missed - the mean bird density can still be calculated. The principal reason for this is that the primary purpose of the scheme is to investigate relative distribution, averaged over several dates, and not to determine overall population sizes. Also, on some estuaries, counters take more than one day to cover all sectors. 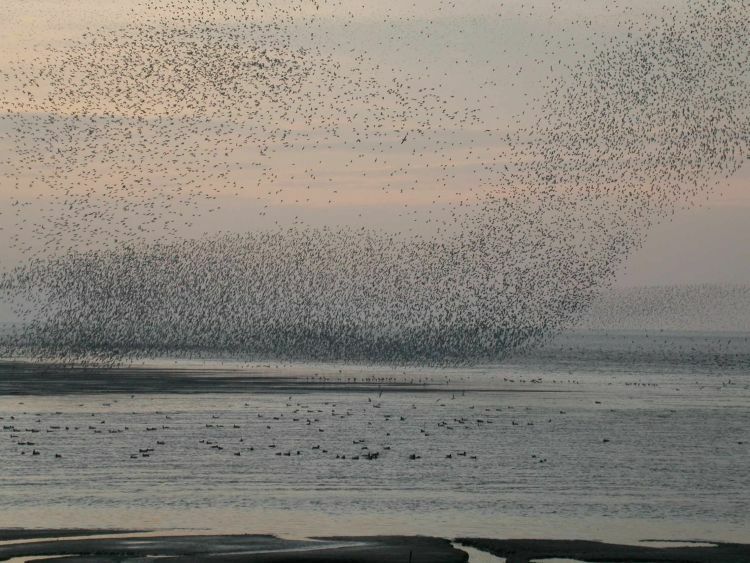 This is justified in that the scheme aims to measure relative bird density on sites: that is, if a sector is important for birds at low water, it does not matter if a flock of Dunlin recorded there was also recorded elsewhere - the outcome is that we know both areas to be important. Although data collection for all waterbird species is encouraged, as with Core Counts, recording of gulls and terns is optional at the discretion of the individual counter, as they are not priority species for the survey.
. Any particularly unusual counts that are flagged by the online system are checked by the National Organisers and are confirmed with the counters if necessary. on which to record counts birds, all the details requested when using WeBS Online are also requested on the form along with your counter code or your full name and address if your counter code is unknown. The count forms include the basic instructions on how to carry out the survey. Some counters use their forms in the field whereas others record counts in their notebooks and transfer details to the form or to WeBS Online later. Data submitted via paper count forms are input by a professional data input company. Data are keyed twice by different people and discrepancies identified by computer for correction. Any particularly unusual counts are checked by the National Organisers and are confirmed with the counters if necessary.